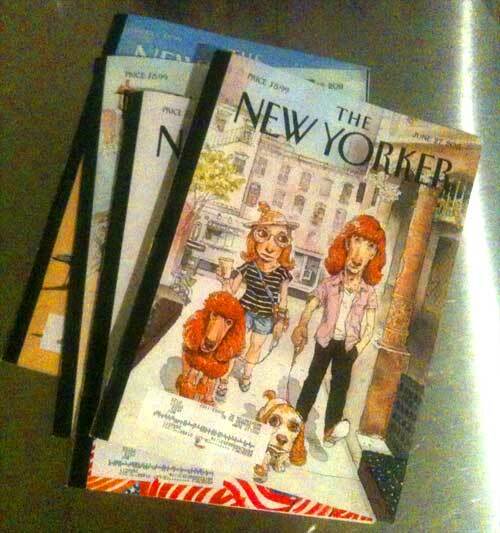 So several months ago I wrote a piece about New Yorker angst for the this blog. Several readers commented that I had hit the proverbial nail on the head. Nothing satisfies a writer more than hearing that. But since then I have have come to realize that my relationship with The New Yorker is unrequited. The Webster’s definition of “unrequited” does not really fill the bill: not reciprocated or returned in kind. But it turns out I expect something in turn from The New Yorker. It is not a rational thought. For whatever reason I expect that if I manage to read the magazine and “get it out of the way” I will be rewarded; I will assuredly be ahead of the game. But the next week there was another one in my mailbox. There was a time when I thought it important to read New Yorkers in chronological sequence, a vestige of my Type A New York childhood. Now I have a vertical file stash of unread magazines (including The Atlantic and Vanity Fair) in my study and I simply grab one at random on my way out of the house curious to see what I have chosen for the day. I feel naked without a magazine. You never know when you are going to have a spare minute while waiting for an oil change, in the checkout line at Whole Foods, before a meeting, even going golfing (the magazine fits neatly into a side pocket of my golf bag), if you arrive early for a lunch date. Just having an issue of The New Yorker on the passenger seat is eminently reassuring. I finally got up the courage to publicly admit my dilemma with a post on Facebook today: I am sitting on 8 unread issues of The New Yorker. A partial solution to my dilemma is to grab a New Yorker, peruse the cartoons, scan the index, and read nothing in sequence. This approach takes the pressure off. One intriguing take on the issue is to Google “unread New Yorkers.” I did it and discovered no one with my unique angst.